This edition of our Member Spotlight features Charity Miles member Mike Murphy! Gene met Mike in January at the Houston Marathon with Aftershokz. When Gene sent out the bat signal that he was coming to town, Mike replied with an amazing story that we had to share here. Hailing from just outside Houston, Mike had quite a busy 2018 logging over 1500 miles throughout the year! As if this wasn’t impressive enough, Mike had no previous running experience before January of last year! The completion of his first race set in motion of a series of events with Mike entering into another race the following weekend. 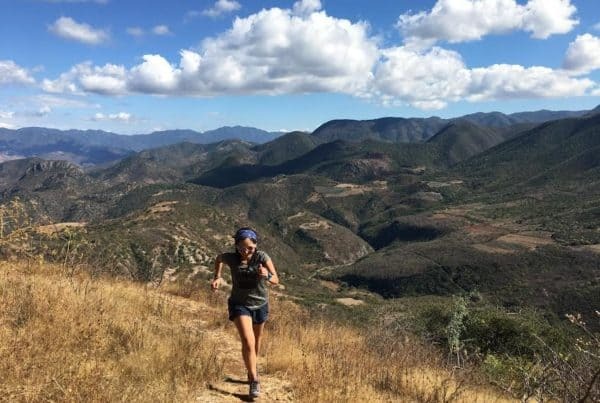 “The next weekend I entered another event to see how fast I could run it if I just pushed the limits, now that I knew what to expect. With a finish time of just under 3 hours, I was hooked. 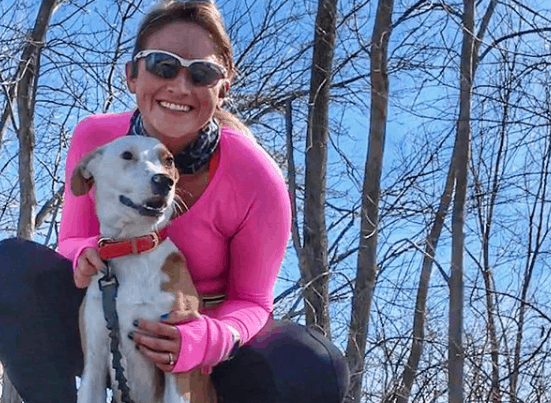 Over the next 18 weeks, I had completed 12 half marathons, an 8K, 10K, 15K and a 10 mile event.” Mike continued to up his mileage throughout the year, completing a jaw dropping 17 half marathons, 4 full marathons and 2 ultra marathons (the longest of which was 66 miles) before the years end! He most recently completed the Houston Marathon on January 20. 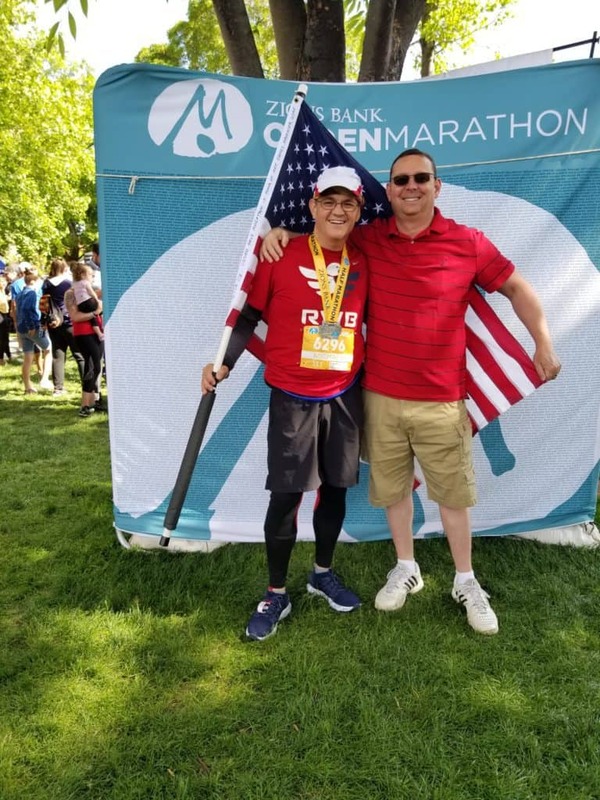 While Mike’s fitness journey is special in that he hasn’t experienced a single injury since rapidly increasing his distances throughout the year, he is distinctly unique in that he uses each race as a chance to honor American heroes. 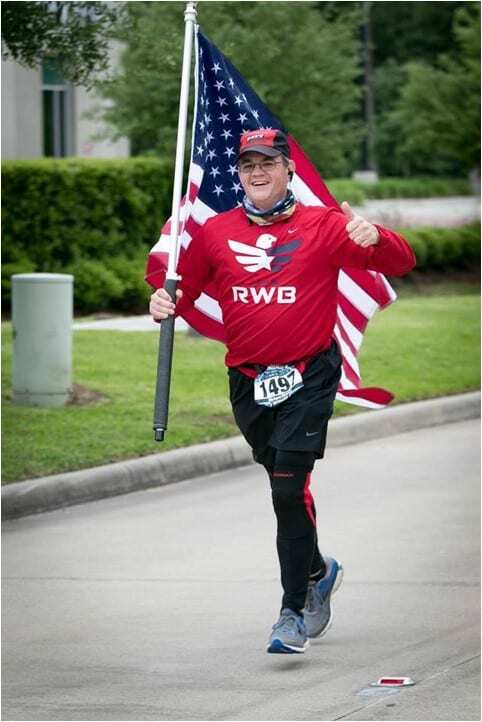 “In every event I carry Old Glory in honor of a specific Veteran, Hometown Hero, or Patriot.” Mike completes each and every race while holding an American flag, with the names of those being honored, the date and the distance logged written on the left-hand side of the flag. “After each event, I send or present the flag to the honoree or a suitable family member if the honor run is posthumous. The miles are more meaningful when they are ran for a specific person as a tribute to their enduring service. A lot of times people come and go and never get a “thank you”.” Carrying the flag in each race is Mike’s special way of honoring the sacrifices of others. He made the decision to carry the flag for the first time after watching his brother Frank carry a flag of his own in a previous race. He remembered the feeling he got while watching his brother carry an American flag and he wanted to share that feeling with others. 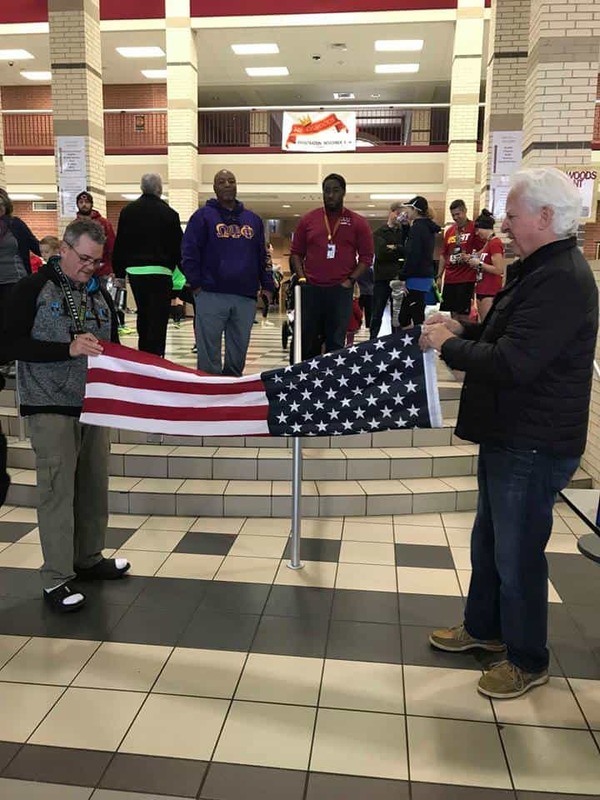 For his first half marathon in Sugar Land, Texas Mike decided to honor his father. A fellow Air Force veteran, Mike’s father was supposed to take part in the race but was sidelined due to back surgery. Mike took the opportunity to honor his supportive father, presenting him with the flag after the completion of the race. 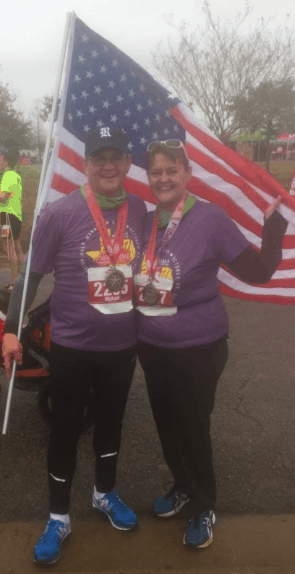 Mike’s most meaningful run occurred in Connecticut when he was approached by a woman who asked if he was carrying the flag for somebody in particular. Upon conversing, Mike had learned that the her son was a Navy SEAL who was killed by a roadside bomb while serving in the Middle East. He decided to honor Petty Officer 1st Class Jason Lewis the following race. Although he has accomplished so much in such a small amount of time, Mike continues to aim high in 2019. His goals for the year include “Continue running injury free, finish every event I enter, complete at least a full marathon every month and complete all the most prominent military marathons (U.S. Air Force Marathon, U.S. Marine Corps Marathon, Bataan Memorial Death March (sponsored by the U.S. Army).” Mike is even attempting an ambitious 200 mile event later this month! 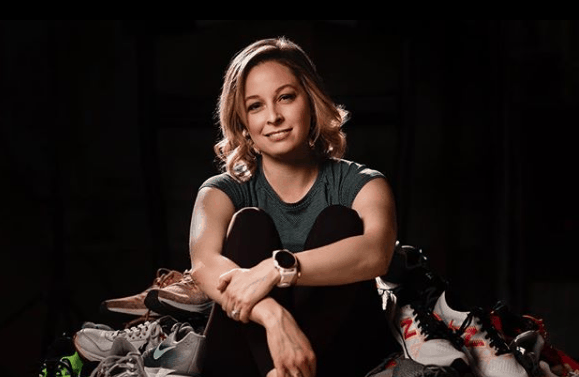 Searching for events to achieve the Marathon per Month goal for 2019. You can keep up to date with Mike’s activities on Facebook and Instagram at “Honor Flag Runner”. Thank you for all you do to honor America’s heroes Mike! It was great meeting you at the Houston Marathon. Congratulations on a fantastic year and good luck achieving all your goals in 2019! 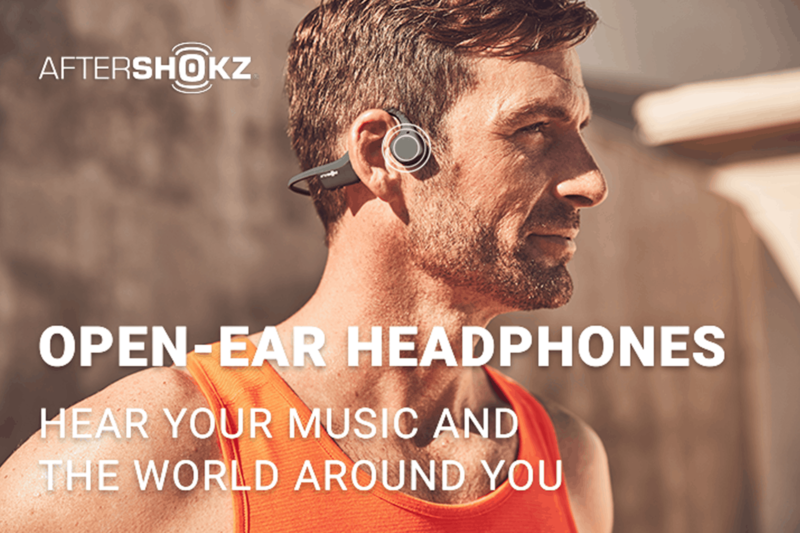 And of course, BIG thanks to our friends at Aftershokz for inviting us to Houston, sponsoring us, and hooking Mike up with a free pair of headphones!